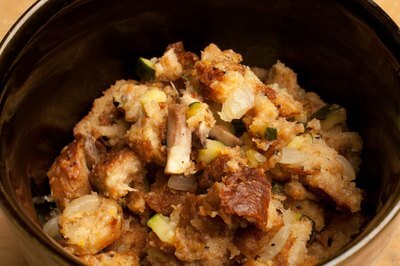 Stuffing, also known as dressing, technically refers to “vegetables, meat or bread stuffed into a cavity of a bird, fish, meat or vegetable” according to BigOven. In common use, however, the term generally refers to a bread-based mixture. It also might contain chopped vegetables such as onions and celery and fruit such as apple pieces, raisins, currants or cranberries. 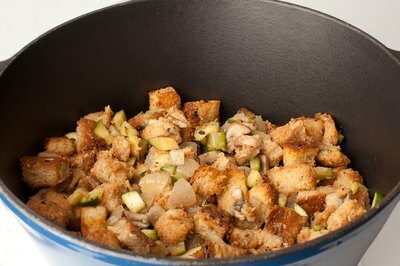 You can make your stuffing the day before you want to serve it to cut down on preparation time the next day. Place the vegetables in the pan and sauté them until they are done to your liking. Mix the sautéed vegetables with the bread cubes and any seasonings your recipe requires in a large bowl. Bring the broth your recipe requires to a boil in a pot or saucepan. Turn off the heat, then ladle the hot broth over the bread mixture. Stir thoroughly to evenly moisten the bread with the broth, but do not crush the bread too much. Cover the bowl of stuffing with plastic wrap. Allow it to cool at room temperature, then place it in the refrigerator overnight. 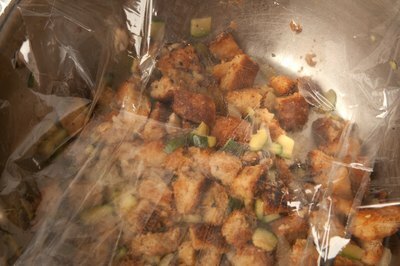 Remove the bowl of stuffing from the refrigerator about an hour before you are ready to use it. 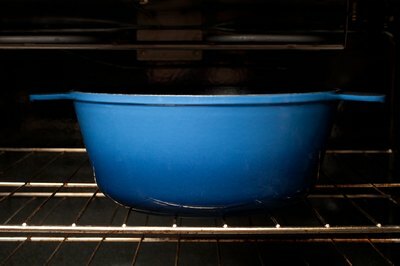 Allow it to warm to room temperature for about half an hour, then transfer it to a baking container as dictated by your recipe. Bake the stuffing in an oven preheated to 350 degrees F for about half an hour, assuming your recipe calls for a 20-minute baking time. If your recipe calls for a different baking time, add 10 minutes to that time (to compensate for the stuffing’s cooler temperature). If you prefer to make the stuffing more than a day in advance, you can do so. Fully cook the stuffing, then freeze it. Place it in the refrigerator to thaw the night before you wish to serve it. Place it in the oven until it is hot just before you serve it. If you prefer to cook the stuffing inside your turkey, mix it and refrigerate it overnight as described. Instead of putting it in a baking dish and baking it, simply remove the stuffing from the refrigerator and stuff the turkey with it. Cook the turkey as the recipe suggests. Can You Use Croutons as Bread Crumbs for Chickens?